The Patterns for e-business are a group of proven, reusable assets that can be used to increase the speed of developing and deploying Web applications. 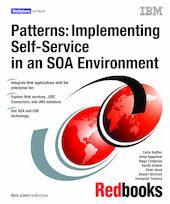 This IBM Redbooks publication focuses on the use of service-oriented architecture and the enterprise service bus to build solutions that help organizations achieve rapid, flexible integration of IT systems. It includes the Self-Service::Directly Integrated Single Channel pattern for implementing point-to-point connections with back-end applications, the Self-Service::Router pattern for implementing intelligent routing among multiple back-end applications, and the Self-Service::Decomposition pattern for decomposing a request into multiple requests and recomposing the results into a single response. This book teaches you by example how to design and build sample solutions using WebSphere Application Server V6 with Web services, J2EE Connectors and IBM CICS, and JMS using the WebSphere Application Server default messaging provider. WebSphere Application Server service integration technology is used to implement enterprise service bus functionality.